When designing a shared room, chances are there is existing furniture and accessories, so it’s always a good idea to do an inventory of what will be re-purposed, what might need a freshen up and what needs to be donated or thrown out. A shared room can feel cramped, so it’s important to select pieces that will complement what you already have in both color and style to create a cohesive base. 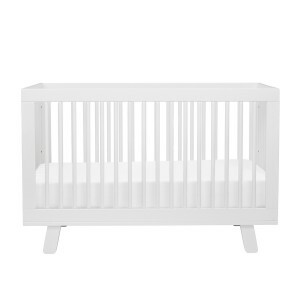 The good news is that brands like Babyletto, ducduc and Oeuf have styles in their furniture ranges that are available in both crib and single bed options. Establishing the right room configuration might involve some playing around but it’s important that function be top of mind. 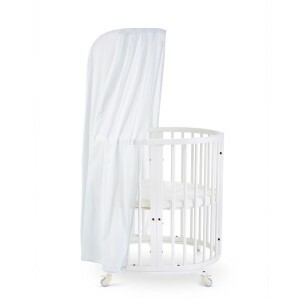 Think about how the room will be used and consider the practical details, like positioning the crib closest to the door to not disrupt your toddler when the baby needs attention. 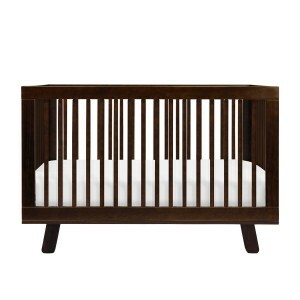 Decorator pieces like rugs, artwork, and a canopy for the crib, when styled correctly, help to define the room’s zones. 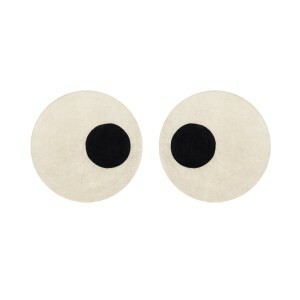 The latest Eye Rug by Maison Deux is definitely eye-catching (excuse the pun) and would sit perfectly in between two beds! During the planning process, it’s important to factor an area—separate to the sleep zones—for both kids to be able to enjoy their own space and explore their individual interests. 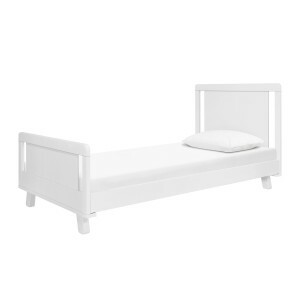 Children don’t need a lot, so it could be as a simple as having an Olli Ella Polli Shelf on a table for drawing, or a spot at the foot of the bed where blocks can be brought out to play! Be mindful that some toddler toys, while great for their development, will not be suitable for the baby and should be kept out of reach. When finalizing the finishing touches it can be challenging trying to merge the style of two children at different age groups. The best way to maintain consistency is by sticking to a color palette–an artwork or printed bed linen could be a great starting point or inspiration! 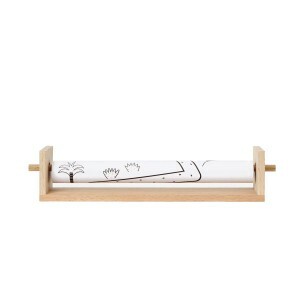 For example the Meri Meri Terrazo print in the Twin set. 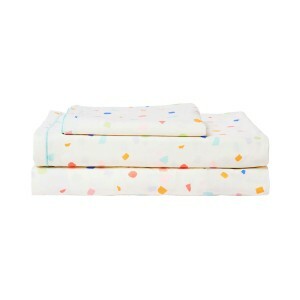 All of those beautiful, vibrant colors of blue, orange, pink and mint will work nicely next to a color block crib sheet, like the Kushies Organic Jersey Crib Sheet highlighting the pink and the blue. 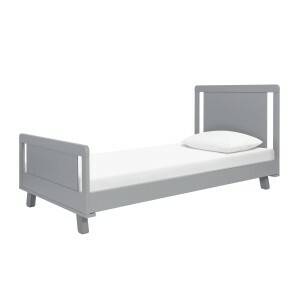 While each child can have their own individual bed linen etcetera some items, such as storage baskets and wall shelves should be the same otherwise it can start to look messy and haphazard. 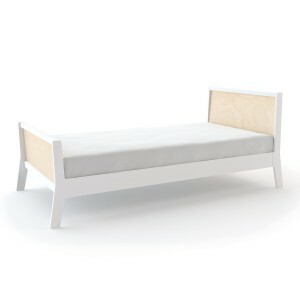 A personal favorite for kid’s furniture is the range by Oeuf. 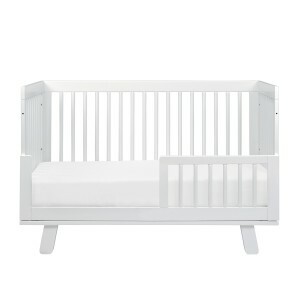 The Sparrow Crib and Sparrow Twin bed are a timeless and classic design that will grow with your children. 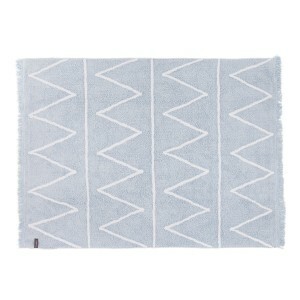 The fact that the Hippy rug by Lorena Canals is machine-washable is a huge plus! If you are also looking to invest in two rugs then this style comes in different color ways, which will keep things consistent without being too ‘matchy-matchy’. 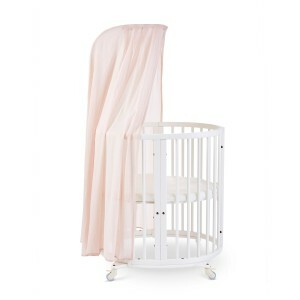 A canopy for the baby’s bed is an effortless way to provide some privacy. 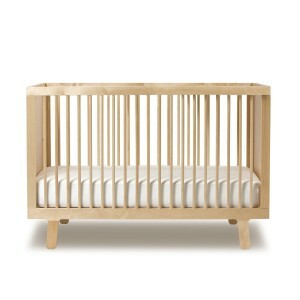 This beautiful collaboration with Stokke X Petit Pehr is compatible for the Stokke Sleepi. 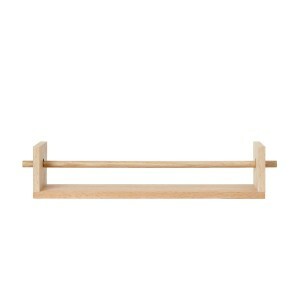 Because every room needs beautiful storage – especially a shared space with double of everything! 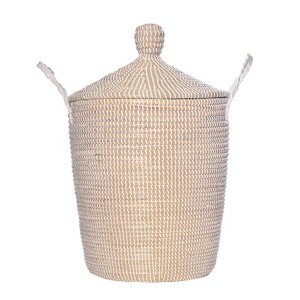 The Neutra lidded basket by Olli Ella will host a myriad of toys during the toddler years and can be switched to a laundry basket as they enter their pre-teens!